Trumpet Day is on the way!! 2/2/22--it’s the date you can hear--(to to to tooo!!). This one truly is a crowd favorite---crowds of one or several or many all delight in the song of the date. 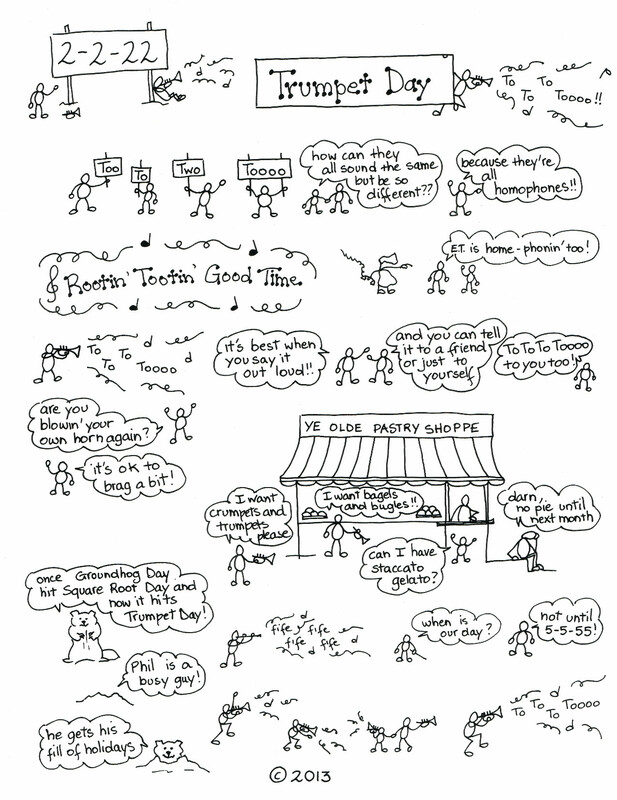 Give it a try---just ask one friend when Trumpet Day is, and watch the happy reaction when you’ve revealed the answer in your best 4-syllable song voice. See? ---it works!! Their enthusiasm is barely dimmed when they learn the day is so far away---they are delighted they get to know it already. Now it’s their turn, and they can share the question and reveal the answer to another. 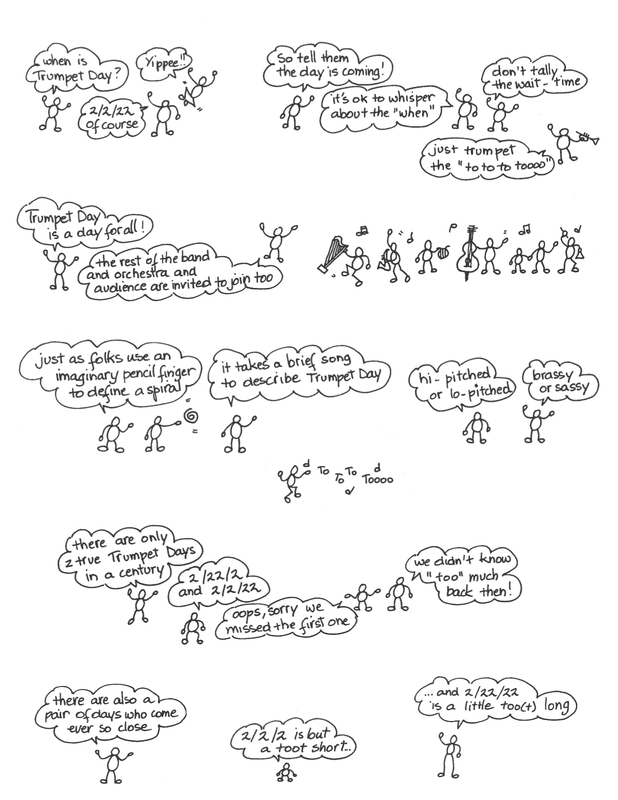 The unexpected song of an answer to your puzzle question “when is Trumpet Day?” will cause (nearly!) all to forgive the fact that this date is on such a distant horizon. Granted, it’s a few years out, but their smile will show they are reassured to know it’s on the calendar, and is one day closer each morning! 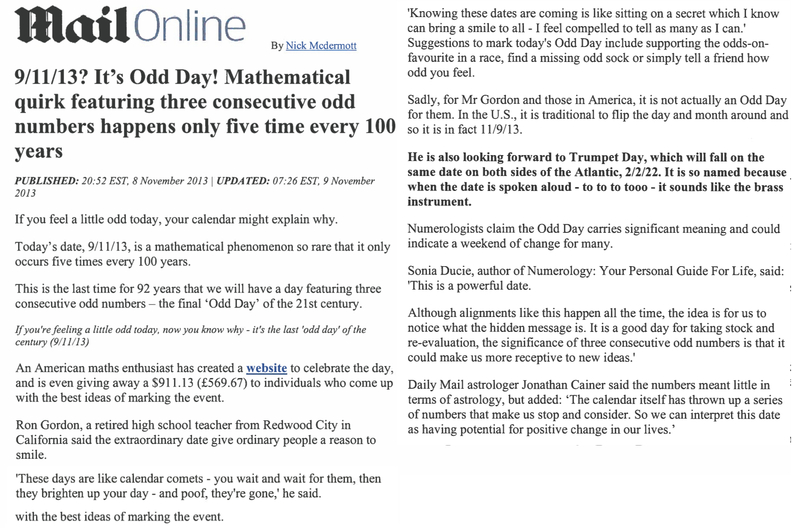 Trumpet Days are rare---we have only two true Trumpet Days in a century---2/22/2 and 2/2/22---sorry we missed the first one, but we didn’t know “too” much back then. Two others merit recognition: 2/2/2 is but a toot short, and 2/22/22 is a little too(t) long. 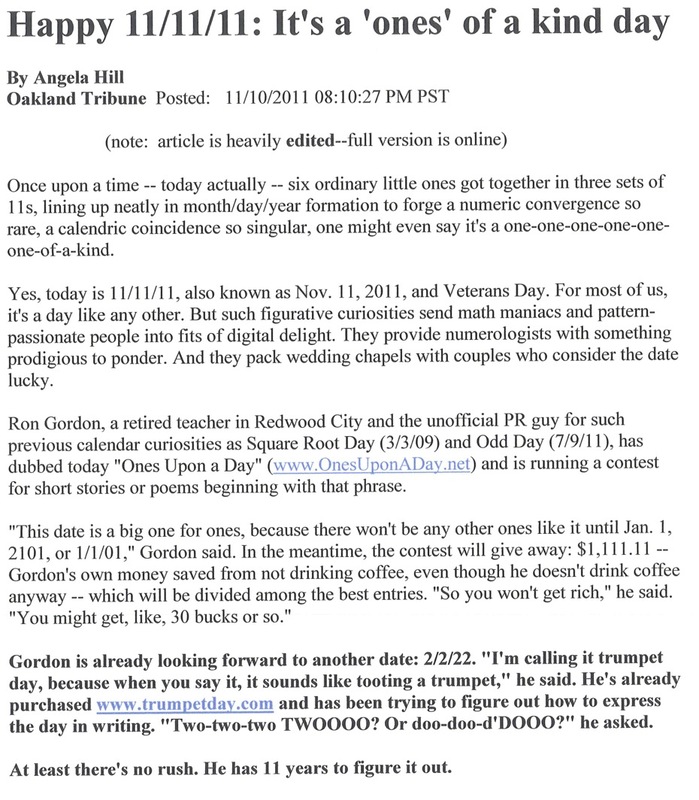 The Trumpet Day Contest features our largest prize ever----$2,222---with nary a decimal. The prize will be shared by lots of folks---we will have 2+2+22 plus “to” plus “too” plus “two toooo! !” winners. Our best holiday math suggests that means Fifty-Two people will divide the prize---no one gets really rich, but all can brag and tooot their own horns about their brilliant accomplishments. 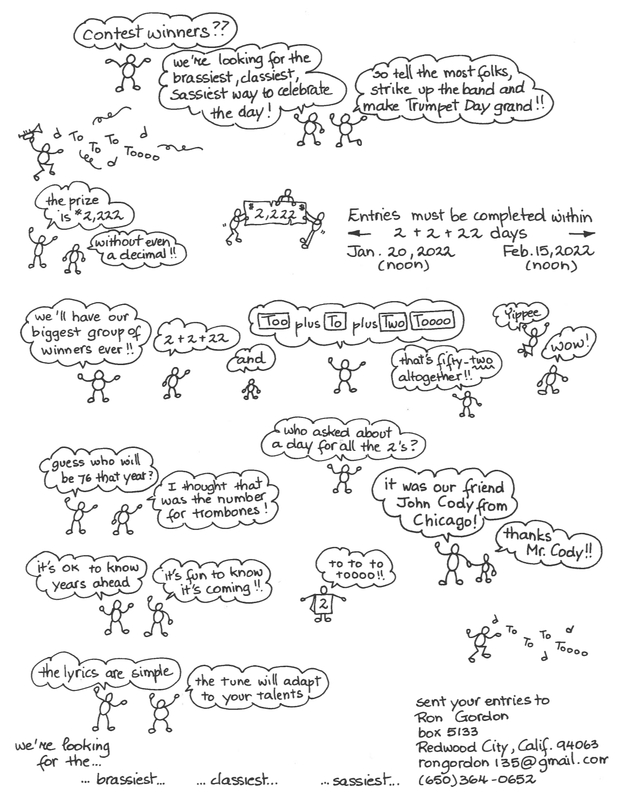 Oh, p.s.---contest entries must be submitted within 2+2+22 days of Trumpet Day, so the entry period will extend from noon on January 20, 2022 through noon on February 15, 2022. This site will be updated with contest details. ‘till then, to-toto-loooo!! !